Local colleges with astronauts who have received one or more degrees: Princeton, 5; Penn State, 4; Drexel and Rutgers, 3 each; University of Pennsylvania and Lehigh, 2 each; Villanova, Thomas Jefferson, and the University of Delaware, 1 each. 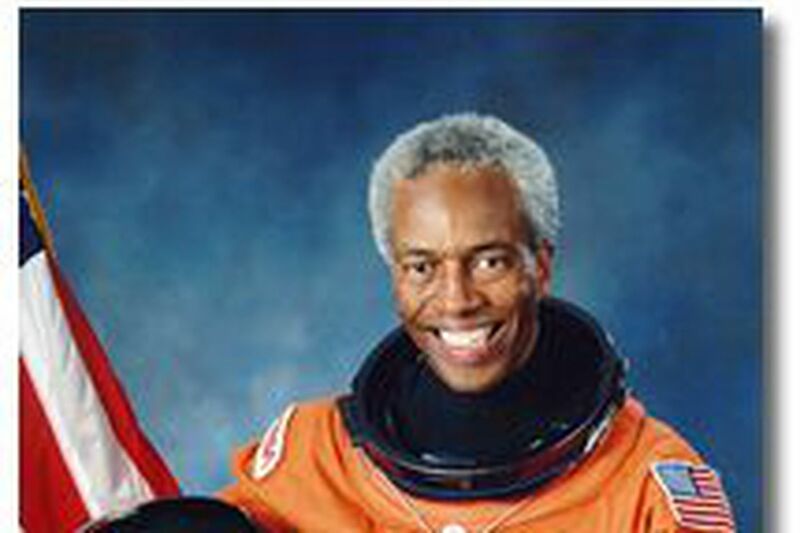 Guion S. Bluford Jr.: born in Philadelphia; bachelor's in aerospace engineering from Penn State; flew on Challenger and Discovery. Andrew Allen: born in Philadelphia; bachelor's in mechanical engineering from Villanova University; flew on Atlantis and Columbia. James P. Bagian: born in Philadelphia; bachelor's in mechanical engineering from Drexel University and doctorate in medicine from Thomas Jefferson University; flew on Discovery and Columbia. John-David Bartoe: born in Abington; bachelor's in physics from Lehigh University; flew on Challenger. Daniel Bursch: born in Bristol; flew on Discovery and Endeavour. Christopher Ferguson: born in Philadelphia; bachelor's in mechanical engineering from Drexel University; flew on Atlantis and Endeavour. Scott J. Horowitz: born in Philadelphia; flew on Columbia, Discovery, and Atlantis. Daniel M. Tani: born in Ridley Park; flew on Endeavour, Discovery, and Atlantis. Charles Conrad Jr. (deceased): born in Philadelphia; bachelor's in aeronautical engineering from Princeton; flew on Gemini 5 and 11, Apollo 12, and Skylab 2. Theodore C. Freeman (deceased): born in Haverford, never flew in space. Robert Cenker: born near Uniontown; bachelor's and master's in aerospace engineering from Penn State and master's in electrical engineering from Rutgers; flew on Columbia. Terry J. Hart: bachelor's in mechanical engineering from Lehigh University, master's in electrical engineering from Rutgers; flew on Challenger. Paul J. Weitz: bachelor's in aeronautical engineering from Penn State; flew on Skylab 2 and Challenger. Paul W. Richards: bachelor's in mechanical engineering from Drexel; flew on Discovery. Lodewijk van den Berg: master's in applied science and doctorate of philosophy in applied science from University of Delaware; flew on Challenger. James Pawelczyk: master's in physiology from Penn State; flew on Columbia. Garrett E. Reisman: bachelor's in economics and mechanical engineering from University of Pennsylvania; flew on Endeavour, Discovery, and Atlantis. Gregory T. Linteris: bachelor's in chemical engineering and doctor of philosophy in mechanical and aerospace engineering from Princeton; flew on Columbia. Mario Runco Jr.: master's in atmospheric physics from Rutgers, flew on Atlantis and Endeavour. James C. Adamson: master's in aerospace engineering from Princeton; flew on Columbia and Atlantis. Daniel T. Barry: master's in engineering and master's and doctorate of philosophy in electrical engineering/computer science from Princeton; flew on Endeavour and Discovery. Gerald P. Carr: master's in aeronautical engineering from Princeton, flew on Skylab 4. UPDATE: Marsha S. Ivins: She was born in Baltimore but grew up in the region and graduated from Nether Providence High School in Wallingford, flew on Columbia and Atlantis. Source: NASA and NASA astronaut fact book.